Let’s face it, if you are a teen or adult with ADHD, you probably lose track of what you need to accomplish each day. To-do lists, while a great idea, are often written on pieces of paper and then forgotten or lost. 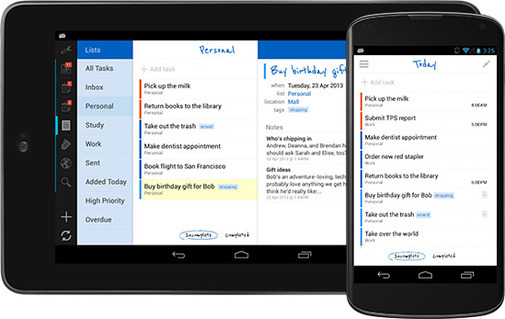 But with today’s technology, creating a to-do list that can’t get lost and stays with you throughout the day is easy. Evernote – a storage app for keeping track of text, photos and audio notes. You can create different notebooks and categorize your notes to help you keep track of everything going on in your life. Evernote keeps all of your information in one place and has a search to let you find your information quickly. This app is available for iPhone and Android and is free. Bento – Bento has a place to organize your contacts, keep track of your projects and plan events. It has built in templates that can be customized to fit your life and planning style. Made for iPhone and costs $4.99. Due – super fast reminders, reusable egg timers – This app lets you add a task and set a reminder. You can’t prioritize your tasks but there are different reminder alert tones; use the louder ones for really important tasks. It is easy to quickly add a task and set a reminder and just as simple to change or delete the task. It is available for the iPhone and the iPad and costs $4.99. Clear – Clear is a to-do list app that allows you to create multiple to-do lists in different categories. For example, you might have a homework to-do list, a shopping to-do list and a chores to-do list. You simply create your list and then swipe when you have completed the task. You can email the list to yourself or to others. According to the information on iTunes, it is available for iPhone and iPod and will be available for iPad in the future. The app costs $1.99. Remember the Milk – This app is available for Android and iPhones and will sync between your different devices so you have an updated to-do list, no matter where you are or which device you are using. There is an annual fee for using this app but may be well worth it if it keeps you on track and organized. You can download and use the app for free but a one-year subscription is $24.99. EpicWin – EpicWin combines to-do lists with a quest and adventure game. It allows you to use your everyday tasks, such as doing the laundry, as goals in the game. You choose an avatar and gain points every time you complete a chore. As you finish more chores, you develop skills, gain riches and move up in levels. This app is available for iPhone and is $2.99. HomeRoutines – Create lists for completing household chores – breaking down tasks and keeping the list ordered by day or week. You might create a list of what you do on weekday mornings, one for tasks that need to be completed weekly or what you include in monthly cleaning. You can do daily, weekly, bi-weekly, monthly or seasonal routines. The app keeps track of what you have already accomplished so whenever you are feeling like you never get anything done you can check to see how much you have accomplished. The app is available for iPhone and iPad and costs $4.99. Wunderlist – A simple app to keep track of all your tasks. You can manage and share your lists and check off each item as you complete it. The app keeps track of what you have completed and allows you to create numerous lists, such as one for shopping, one for work, one for schoolwork, etc. It is for Android and is free.